Hey, I saw your profile and its good to know there’s some more dean koontz fans out there. Anyway, I saw the pictures you had from emery, utah. If I remember correctly, there used to be a letter E in the mountains that you could see from the little park there. Do you know what I’m talking about? If so, next time you’re out that way could you take a picture of it for me? Thanks, and I love your photography! I’m planning a trip down to the Swell next weekend. Never been there before. ATVing, Geocaching, and old ruins are all on the agenda of what we want to do. Can you suggest the best place for a first timer to start? We will only be there 1 1/2 days. A good place to check things out is near Goblin Valley state park. The park has a gift shop with maps and other information on the area. From there it is only a short drive to Little Wild Horse Canyon (a nice slot canyon), Temple Mountain (old uranium mining area), and Behind the Reef Trail (a fun looking atv trail, I haven’t been yet). 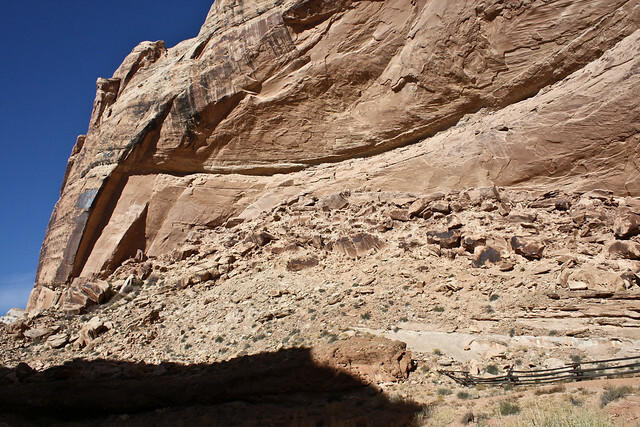 There are also other slot canyons and atv trails near this area. Goblin Valley has a nice campground but if you don’t want to stay in the park there are many other backcountry camp spots. I hope this helps and have a fun trip to the swell. CAN YOU GIVE ME DIRECTIONS TO THE CAVE IN BLACK DRAGON CANYON???????? It is nearby the pictographs. It is left of the writings at the top of the slope. If you check out Summit42’s photo, it points right to it.